Are there any zoning issues that would prevent us from building a home on the property? Is there access to the land via a public road? Is there power on the land or electric nearby? Is there a well in place? Is there a septic design/permit in place? …if no, has perc testing been done? 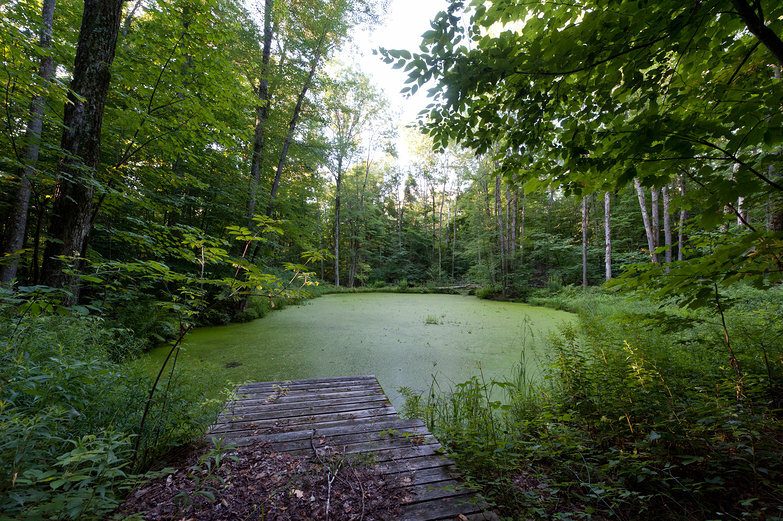 Will the land support a traditional septic system? Our first potential land-site is located at the back of a lengthy dirt road, winding past several rugged, backwoodsy homes. The parcel's drive is a steep hill, almost untraversable in a little hatchback like ours. It ends in a stark, intensely wooded slope, with a rushing river arcing through the rocky terrain. 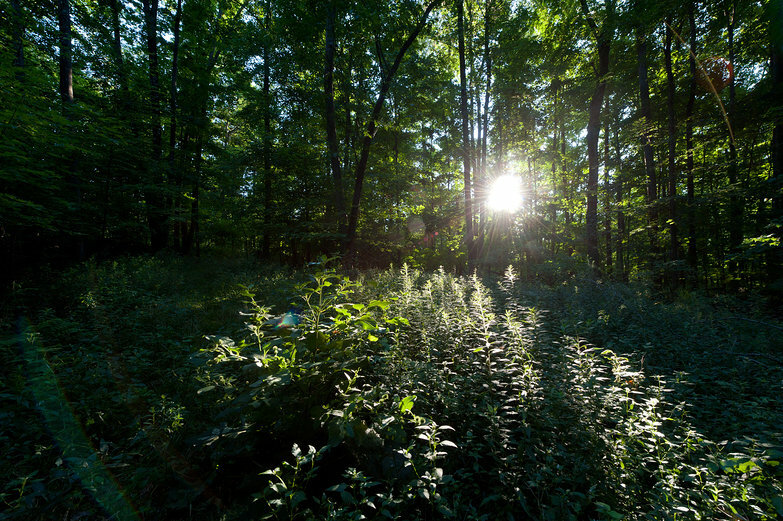 If we wanted a forested piece of land in which we could hike for hours, this would be it. I'm excited immediately, loping around the steep embankments, imagination on overdrive, already planning how we will harness the stream's mini-waterfalls to generate hydroelectric power. Tara doesn't like it at all, saying it feels too wild, too in-the-middle-of-nowhere, and too isolated. With a little more inspection, it becomes apparent that the majority of the acreage is sharply graded, ruling it out entirely. So, we return to the car and vacate from nowheresville, heading back to the main road. And so it goes, as we zig-zag across the western border of Vermont for the next several hours. Almost all of the plots we stop to survey evoke an immediate NO, which is strangely encouraging. If we can feel such a sense of "wrongness" from a place, then surely we'll be able to recognize when one of them finally feels right? 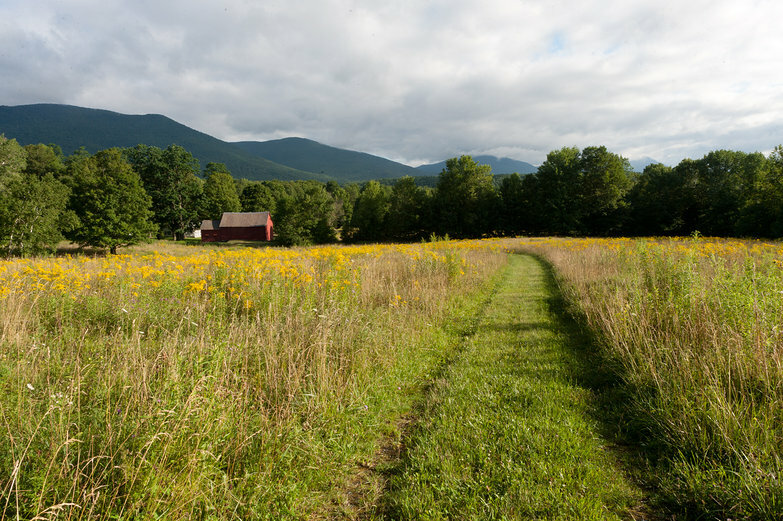 Arriving in the Bennington area, we pass through picturesque farms and woods, cruising over rolling hills as we head towards our next potential site, a ten acre plot on Maple Hill Road in the small town of Arlington. We're getting a little weary of looking at land, but find ourselves bolstered by the surrounding countryside—the region is intensely welcoming. 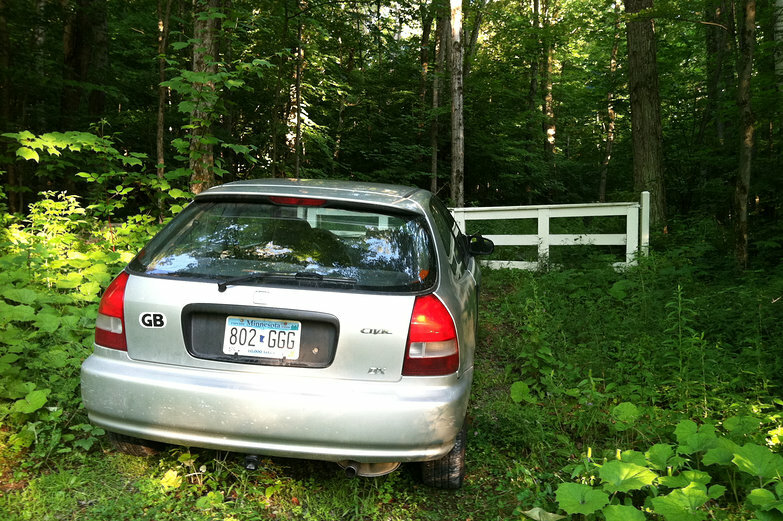 After a few laps, we locate a white gate, our landmark for the entrance to yet another parcel of land. Getting out of the car, we are immediately awash with the feeling of coming home. This could be our driveway! Together, we walk through a maple woods, up the curving sweep of a roughed-in path, where perhaps a gravel driveway used to be. A rustling of leaves to the right catches our attention; we watch in awe as two enormous wild birds (pheasants?) beat their wings and fly away into the forest. Smiling, we continue onward, meandering through the trees, picking and eating wild raspberries, already discussing how we'll tap the maple trees that grow in abundance here. At the end of the "drive", we arrive at a clearing where, conveniently, a well has been drilled. Pushing a bit further on, through the brambles and woods, we come upon what the advertisement said was a "spring-fed pond" the size of a swimming pool. Standing on the dock, listening to croaking frogs, we chat sophomorically about how we might restore "our" green, weed-covered pond, to swimmable clarity. Our walk ends on the far side of the property, where the wooded land opens into two long, grassy, sunny meadows. Tara immediately begins talking about how we'll have sheep grazing and vegetables soaking up sunlight here. We are struck by just how right this place feels. We can already see ourselves living here, and we've been calling it "our land" ever since we arrived! As much as we'd like to unpack our car and stay forever, it's time to hit the road once more. Though we love this land, there are other properties to see, and much we need to learn about this process before making any decisions. With a handful of wild raspberries, we drive off to the next destination on our list. This time, I take the wheel and Tara calls the real estate agents. Ten parcels down, a dozen or so to go! So exciting!!! can't wait to hear what you end up with. Vermont sounds lovely. I am jealous of the property you found, after my TransAm ride I came home immediately wanting to move to bigger acreage yet stay in the Austin, TX area. If I may ask how many acres is it and what does land like that go for in the Vermont area? Thanks Katy--hopefully we'll know soon! The plot is about 10 acres, and the asking price was $69,000 (we haven't closed on the deal yet). Prices fluctuate pretty wildly depending on location/amount of improvements (roads/septic designs/electricity/permitting etc) and zillions of other factors. We've seen parcels in the 10 acre range going anywhere from $30,000 to $150,000. If you can afford to, we'd recommend looking--it is definitely a buyer's market right now.